See below for photos of the groundbreaking ceremony and getting ready to set the foundation. This classroom is providing needed space for the students, who were sitting almost 100 children per classroom prior to this project. 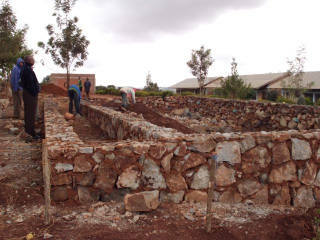 The classroom was built with bricks made by the CESB press technique (Compressed Earth Stabilized Blocks), a sustainable building technique, as the bricks are not wood fired. Mlimani classroom, Aug 2012 Inspecting the foundation. Mlimani classroom, Aug 2012 The foundation. Mlimani classroom, Aug 2012 Soil breaking; getting ready for the foundation.